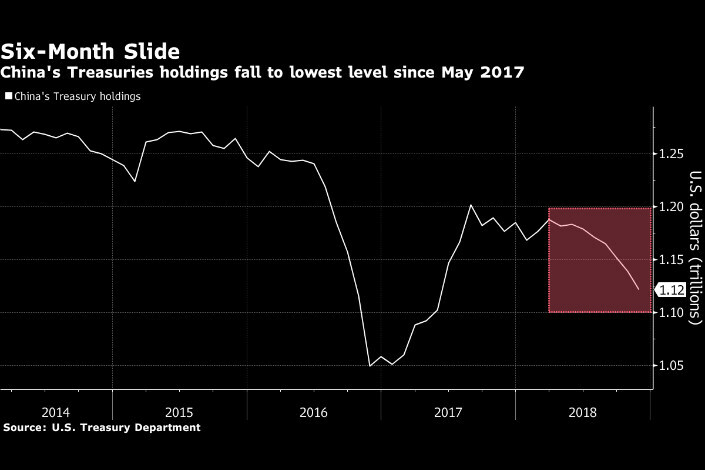 (Bloomberg) — China’s holdings of U.S. Treasuries fell to the lowest level in a year and a half amid a bruising trade war with the Trump administration. 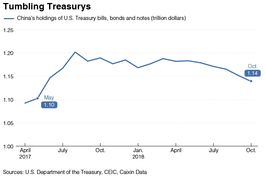 China’s pile of notes, bills and bonds dropped to $1.12 trillion in November, from $1.14 trillion in October, according to data from the Treasury Department released Thursday. It was the sixth straight decline and left the nation’s stockpile the smallest since May 2017. 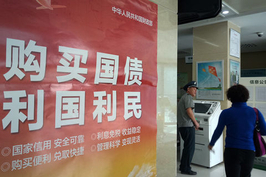 China remains the U.S.’s biggest foreign creditor. Japan is next, with $1.04 trillion, up from $1.02 trillion in October, which was its smallest amount since 2011. The data come as U.S. and Chinese delegations wrap up two days of trade discussions in Washington, with just four weeks until a deadline for the U.S. to escalate tariffs on $200 billion of Chinese goods. President Donald Trump said the talks are going well, but no final agreement will be reached until he meets with President Xi Jinping “in the near future.” The two leaders have given their officials until March 1 to reach a deal. The onshore Chinese currency rallied this week to about 6.7 per dollar, its strongest since July. 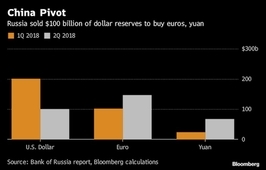 It has rebounded since approaching the closely watched level of 7 per dollar in November, when the country’s foreign-exchange reserves rose 0.3 percent to $3.06 trillion.